I think I’ve had an apple everyday for about 20 years. (Clearly, I’ve taken the “apple a day” saying very seriously). 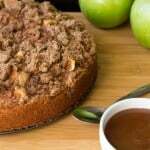 So when I was looking through my old fall recipes on Just So Tasty, I was surprised when I realized there were barely any apple recipes. 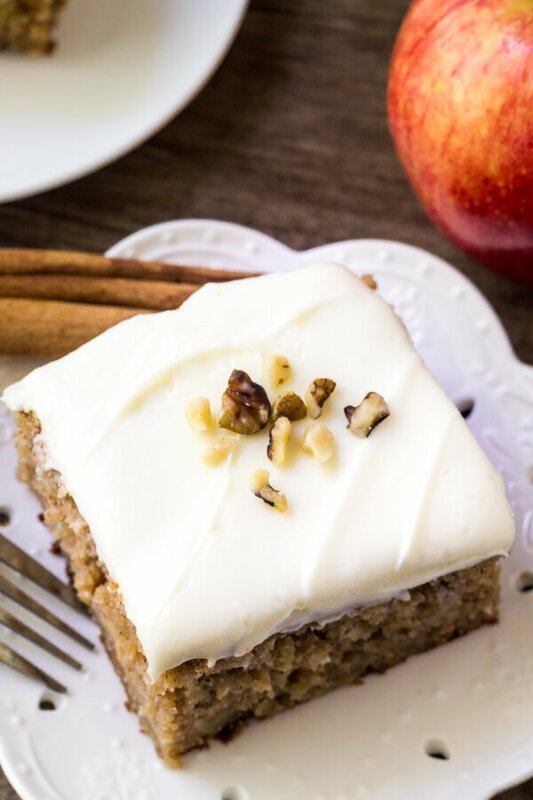 So, I figured it was time to share this Apple Spice Cake with cream cheese frosting. 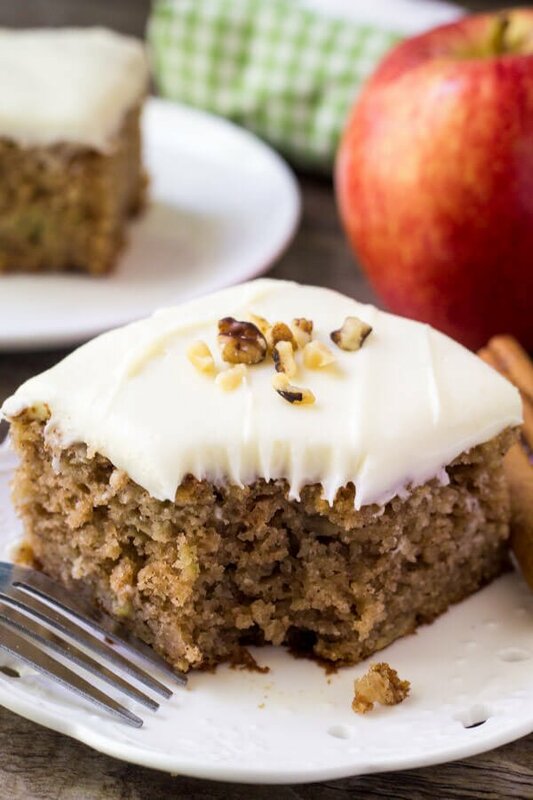 It’s a dense, super moist spice cake that’s filled with apples. Then it’s frosted with creamy, fluffy cream cheese frosting. Because adding cream cheese frosting is always a good idea. Then our cake is packed with flavor. Using brown sugar adds a delicious caramel flavor – then cinnamon, nutmeg and ginger are the trifecta of spices. Not to mention the delicious apple flavor. For this recipe we’re using a combination of apple sauce and shredded apple. In baking, I typically recommend using a tart, crunchy apples because the flavor mellows during baking. 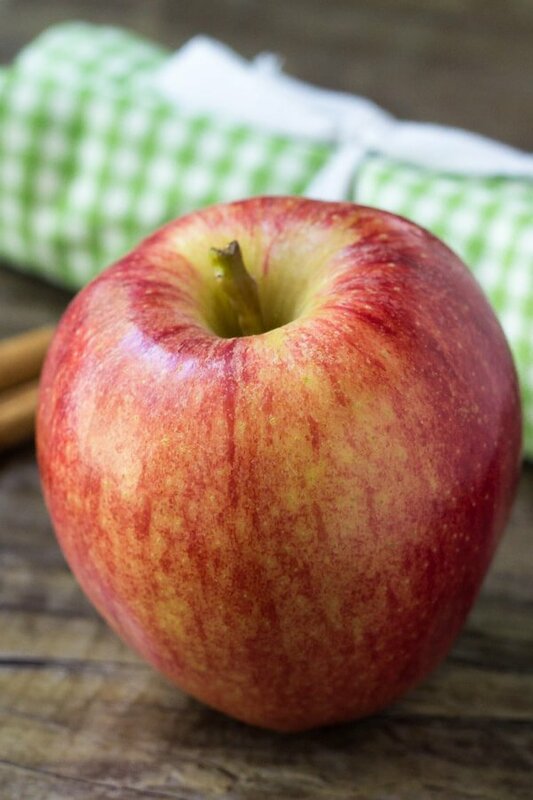 Apples like granny smith, golden delicious or pink lady work perfectly. I wouldn’t recommend using red delicious though, since it’s flavor isn’t as strong. After the cake is frosted, it’s then topped with fluffy cream cheese frosting. Depending on how much frosting you like, you might have a little left over. But I’ve never complained about that. This cake is perfectly dense, moist, filled with flavor and completely perfect for fall. 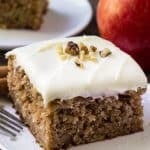 And if you love carrot cake or zucchini cake – I definitely recommend trying this apple spice cake with cream cheese frosting. 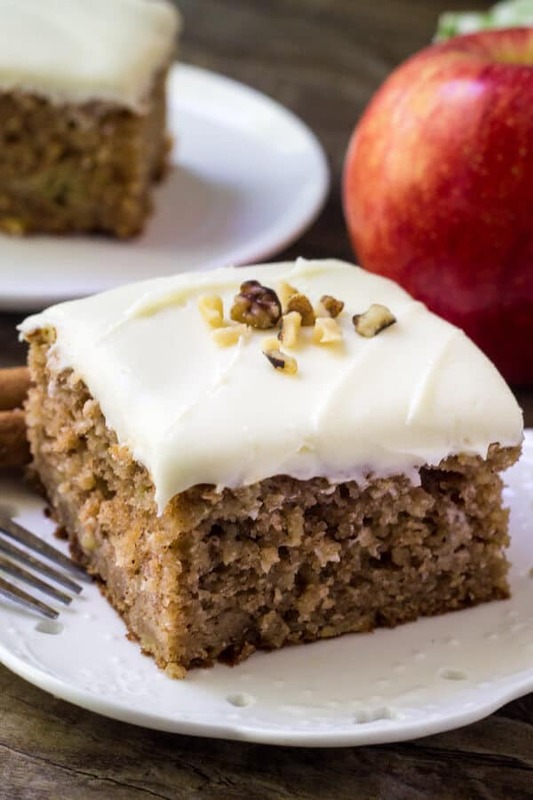 This apple spice cake with cream cheese frosting is packed with flavor, filled with cinnamon, and has a delicious caramel undertone thanks to brown sugar. Then topped with fluffy cream cheese frosting - it's the perfect cake for fall! Grease and flour a 9x13 inch cake pan. In a large bowl whisk together the flour, baking soda, baking soda, salt, cinnamon, ginger & nutmeg. In a large bowl using an electric mixer beat together the oil, sugars, eggs and vanilla. Then stir in the apple sauce, grated apple and sour cream. Slowly beat in the flour mixture, turning off the mixer and scraping down the sides of the bowl as necessary. Pour into the prepared pan and bake for 40-45 minutes or until an inserted toothpick comes out clean. In a large bowl beat together the butter and cream cheese frosting until no lumps remain. Slowly beat in the cream cheese about 1 cup at a time, then beat in the vanilla extract and 1-2 tablespoons cream as needed. 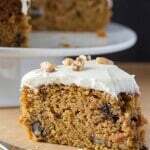 Frost the cooled cake, then top with chopped walnuts. The cake batter will look soupy, but it turns out just right after baking! I was so nervous, not knowing if maybe I hadn’t added the correct amount of flour. Just wanted to relieve any fears of others baking this cake for the first time. It is amazing!!!! 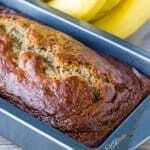 Did you use sweet or unsweetened applesauce? Could you omit the grated apple and just use all applesauce? I haven’t tried it – so I’m not 100% sure of the results. My concern would be that using all apple sauce might add too much moisture to the batter. So you might not need quite as much. I’d maybe try 2 cups total of apple sauce instead of 1 cup apple sauce and 1 1/2 cups grated apple. I am baking mine in a bundt pan. How long should I bake it? I haven’t tried making this in a bundt pan, so I’m not sure of the bake time. I’d guess around 1 hour – or until an inserted toothpick comes out clean and if you gently nudge the pan it doesn’t wobble. For the cream in the frosting, you can use whipping cream, heavy cream, or half and half cream. I need to make the cake on Wednesday and won’t serve it until Saturday. Should I freeze it without frosting — or just refrigerate (with or without frosting)? I def don’t want it to dry out for sure. Thank you!!!!! Would gluten-flour blend work just as well? 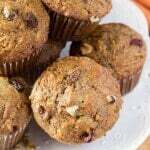 To be 100% honest, it’s a little hard to know because different gluten free flour blends behave pretty differently. If it’s a brand that you’ve substituted for all-purpose flour in other recipes before and it’s worked well, then go for it! This was excellent! I cut the recipe in half- well I used 2 eggs- but everything else I cut in half and this was so delicious! I only have my husband and I here because the kids are grown and living on their own, but by cutting it in half- it worked perfectly as a snack cake and my husband really loved it. That is a huge compliment because he didn’t think he liked apple cakes.